Ever tried baked sweet potato chips? Do give it a go if you like this delicious vegetable or want your kids to have a healthy alternative to chips. To me and my daughter, it’s absolutely a tasty snack or side dish. When I started to take photos of these freshly baked sweet potatoes chips, my daughter grabbed one from behind. Pretty understand it’s quite a torture for her to wait until I finished all shootings as usual. So this time, I just took one shot, off I went on with my other cooking, then let her have as many chips as she wanted. Place a baking tray on the middle rack of oven. Preheat the oven at 220C/428F. Peel the sweet potato, or keep the skin if you like. Cut into strips, about 2 to 2½cm in thickness. Transfer into a large bowl. Add sugar, ginger powder, paprika, salt and oil. Mix well and coat the sweet potato evenly. Remove the preheated tray from the oven. Quickly arrange the sweet potato onto it. Put it back into the oven and bake for about 30 minutes. After the first 15 minutes, take the tray out and turn the sweet potato to the other side. Continue to bake until cooked through and evenly brown. I didn’t rinse the sweet potato. If you’d like to rinse the sweet potato, make sure to wait until it dries completely before moving onto cooking. Otherwise, the sweet potato chips would become mushy. Pre-heating the empty baking tray will help the surface of sweet potato chips turn brown and crispy. The raw sugar will help add a caramelized flavour to the sweet potato after baking. You might skip it if you want. Ground paprika is not hot after all, just help enrich the taste of the sweet potato. The ginger powder goes so well with the sweet potato. You might adjust the amount to your liking. 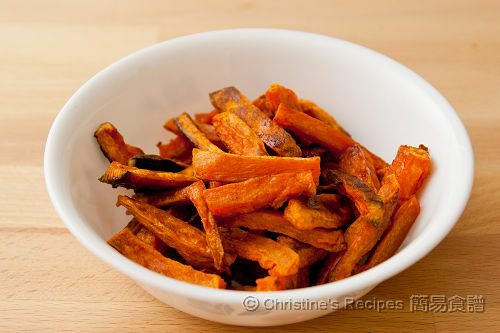 How about pinch of cinnamon to the paprika spice with the baked sweet potato chips? :D ...indeed, I enjoy this snack too. love these guilt-free and healthy chips. I'd love to try these sweet potato chips but must I need to grease the tray first? The oil called for in this recipe is well enough for coating the sweet potato strips, and helps avoid from sticking to the pan. Yet feel free to spray some more on your baking tray if necessary. I know these are healthier than regular potatoes! It looks yummy! I have never had something like this but it looks like a much healthier alternative to crisps and the likes. Thanks for the recipe, Christine :)! I would love to try some baked sweet potato chips too! I've never had any luck baking them in the oven (maybe I cut them too small), but since I have an actifry (it's basically like an oven but it does all the turning for you coz it just keeps stirring and sturrig and stirring) now, I make them regularly and they're sooo good. I notice yo u use regular yams. Have you tried purple sweet potatoes? The skin is purple but the flesh is yellow/golden. They are waaay better than the regular sweet potatoes. I tried deep frying them both and the red / orange ones come out soggy and pretty much soaked up half the oil. The purple sweeties (that's what they're called) were crispy and hardly soaked up the oil. The inside has more texture than the regular ones, the regular yams are very soft and soggy-like insde. Try them! Your daughter will love them.I made some tonight and My son ate them like there's no tomorrow. I've tried the purple ones, very yummy. But ever tried deep-frying them yet. Thanks for your tip. Talking about the red sweet potatoes, maybe we're very lucky in Australia, those red ones are gorgeous, very suitable for baking. I seldom deep fry chips for my kids. My daughter likes baked red sweet potato chips the most.